Small Groups are a great way to get connected to other people and build lasting relationships. 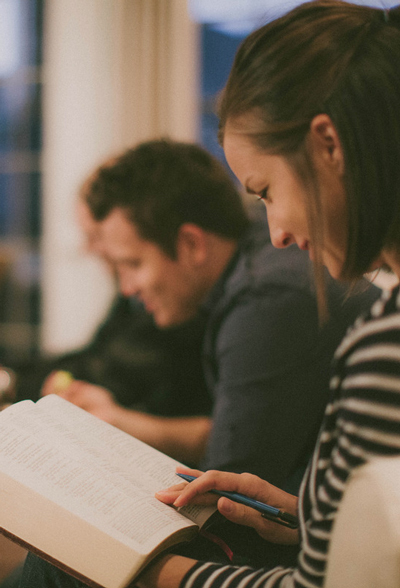 Meet with others looking to grow spiritually and study the Bible together. Join one today and experience a community of people who encourage one another towards becoming fully devoted disciples of Christ. ​In the Bible we see that the early church was fully devoted to Christ and His Word. Therefore, our Small Groups study God’s Word and encourage each other towards full devotion to Christ in all areas of life. Each week we study 5 chapters of the Bible and then share what we have learned from those chapters. ​​ ​In the Bible we see the early church was fully devoted to constant and authentic fellowship with each other. Therefore, we want our Small Group members to form genuine friendships with each other so that they can do life together. By doing this we encourage each other to live the devoted lives Christ has called us to. ​In the Bible we see the early church was fully devoted to the Mission of Christ by sharing the Gospel with the lost. Therefore we ask our Small Groups to be missionally minded and “Reach Beyond” the walls of the church so that we may serve our immediate community and throughout the Yakima valley and to the ends of the earth.